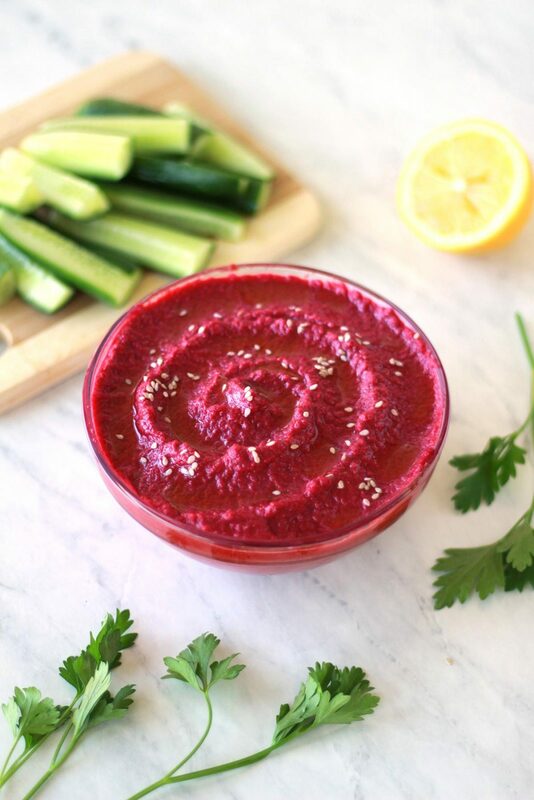 Mutabal shawandar is a vibrant colored Syrian roasted beet dip. This Mediterranean recipe is a great appetizer when you are looking to switch it up from the usual hummus. 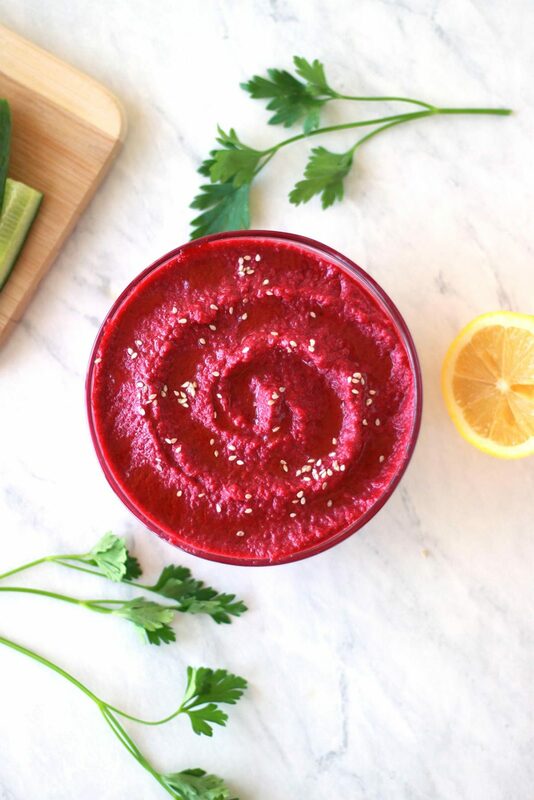 Sweet beets are accompanied by fragrant roasted garlic in this vegan beetroot dip! Did you know that beets are full of antioxidants, can reduce inflammation, and are even said to lower blood pressure? 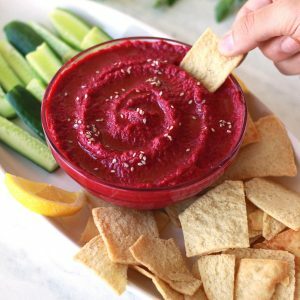 This Mediterranean beet dip is a great way to reap the benefits of this superfood with a unique, simple recipe. 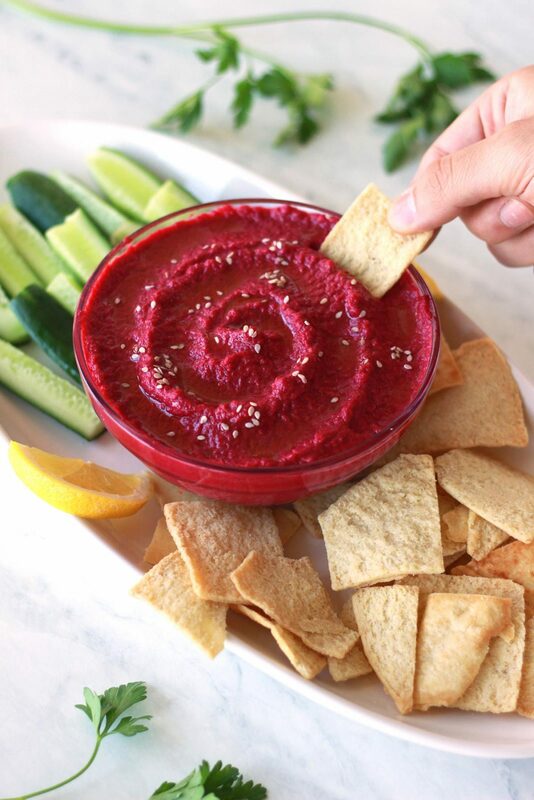 Tahini makes this dip ultra creamy and a great accompaniment to your favorite cracker or raw veggie. 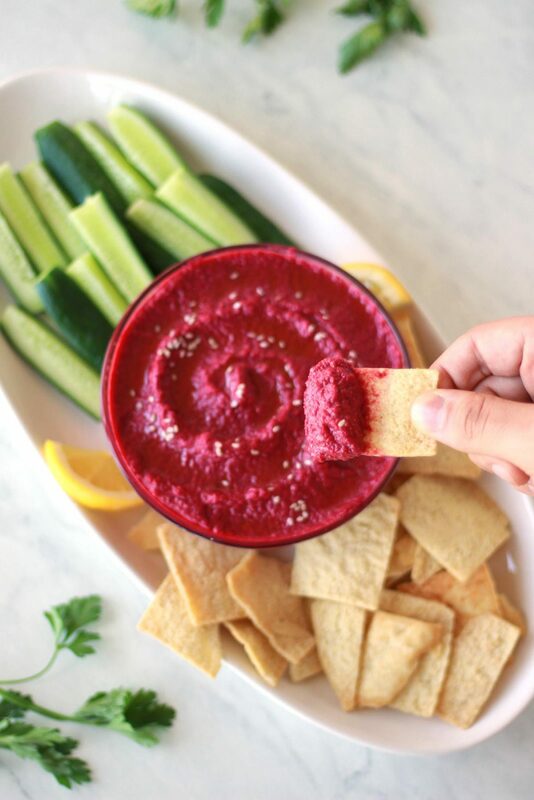 A vegan Mediterranean roasted garlic beet dip, Mutabal Shawandar makes a perfect appetizer with pita chips or raw veggies. Preheat oven to 400F. Drizzle olive oil over washed and scrubbed beets, and cover with foil on a baking sheet. Cut the top off the head of garlic and drizzle with olive oil. Cover the garlic with foil as well. Bake beets for 45 mins - 1 hour, until tender. * Roast garlic for 40 mins - 1 hour, until caramelized, soft, and fragrant. Place cooked beets and caramelized garlic in a food processor or high speed blender along with tahini, lemon juice, and salt. Process until smooth. Add water 1 tbsp at a time if too thick. Taste and add more salt or lemon juice as needed. Serve alongside pita bread, crackers, or raw veggies. Drizzle with extra olive oil. Enjoy! *Alternatively, boil beets until tender, or use cooked beets.